One of the most frequent postings on web forums by people who are starting to collect bikes is 'can anyone identify my bike or frame?' The easiest route to possible identification is find the frame number. It sounds simple enough, but it is made a lot easier if you know where to look. Volume bicycle manufacturers like Raleigh tended to use the seat lug, as in this 1925 Raleigh roadster. The size and font of the numbering could also change over time as illustrated in the Raleigh Moulton frame number, although the location of the frame number was the same. One caveat about Raleigh frame number information on the web. Sheldon Brown is quite accurate on Raleigh frame numbering, except where he supposes about Irish Raleigh production. His information is simply incorrect. As it was posted 'on the internet', it is assumed by many, as an incontrovertible truth, when it is not. Sheldon's pages were a work in progress. Unfortunately, this all came to a halt, on his untimely passing. I will blog accurate information on Dublin Raleigh frame numbers using known examples at a future date. Raleigh have also used the back of the seat tube, either below the seat lug, or above the bottom bracket, the underside of the bottom bracket shell and rear dropout as location of frame number. Some of these locations were used for 'badge engineered' Raleigh production. As mentioned above, the style of font used in the sequential frame number changed over time and the example below was found on a 1920s British roadster. Other British bicycle manufacturers used either the seat lug or a rear dropout. BSA sports frames tended to have the frame number on the left rear dropout. Hercules in the 1950s also used the left rear dropout and used a different font to BSA. Sunbeam during it's time of ownership by AMC used the right hand rear dropout on some models. Bespoke custom frame builders in Britain used various locations to install a frame number. Unusually, some builders put their frame numbers on the bottom bracket shell at the down tube lug. Others stamped the underside of the fork crown. It was not unknown to have the frame number on both the frame and fork. 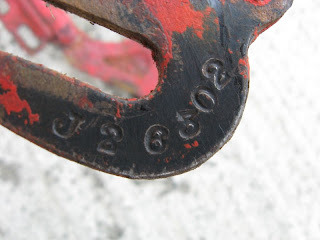 Often the frame number was stamped on the fork steerer tube as well. However, easily the most common location for a frame number was the underside of the bottom bracket shell. The number was usually stamped in line with the axle, or at right angles to the crank axle and parallel to one on the bottom bracket cups. Imported Peugeot bikes from the late 1970s/early 1980s had a frame number stamped into the bottom bracket shell which was parallel to one of the bottom bracket cups. Peugeot also had a paper identifier covered in clear vinyl wich identifies the model, frame size and sequential frame number. The location varied between the underside of the bottom bracket, bottom of the seat tube above the bottom bracket shell, or on the left hand chainstay. The model numbers appear to be slightly different according to the country of sale. Gitane put their frame number on the left rear dropout of their tandems. The sequential frame number is on the bottom part of the dropout and the year identifier above. A further complication and a bit of a red herring can be a re-finisher's number. Frames were often stamped by a re-finisher before being enamelled to make sure the right frame and fork were returned. These are usually 3 digit numbers and can confuse as they are on both frame and fork. Once you have located the frame number, the process of trying to indentify the machine that you have found can begin. Finding the frame number can be difficult if it is only lightly stamped, or been damaged on a rear droput, or covered up with paint. Some small bespoke frame builders didn't bother with a frame number. Late 1980s volume manufacturer (Londonderry built) Viking 531 frames also don't appear to have been given frame numbers. I have also found 1990s examples of Dawes 531 frames with the same problem. Finally, another recent phenomenon which can add to the confusion is post code stamping of a bike frame to try to deter theft and ensure the frame is returnable to it's owner. These are usually 7 digits, usually two letters, three numbers and two letters. They tend to be stamped where they can be easily found, so keep looking to see if there are any others! Great post! I just recently purchased a sunbeam that has the frame number on the rear right drop out. As your blog indicates this means it may be from the AMC era of ownership and I was just wondering where you found this information. I am having trouble aging my bike between either the AMC era or immediately post-war. Maybe we could discuss through email so I could send you some photos? Thanks! Johannes if you want to know more about the Sunbeam marque, get hold of the late John Pinkerton and Derek Roberts 'Sunbeam Cycles - The Story from Catalogues Volumes 1 & 2. It is still available from the Veteran - Cycle Club, but you will have to join to access their book sales. Membership will also allow you to access the Sunbeam Marque Enthusiast who will be able to answer your queries. Yeah I have contemplated that but cannot really afford to drop $60 to join the club and then another $30 to buy the book. I think the V-CC is great I just cant justify the money to join. Maybe one day.